Mac: Apple Mail is fine for most people, but if you really need a powerhouse email client, it falls short in many ways. 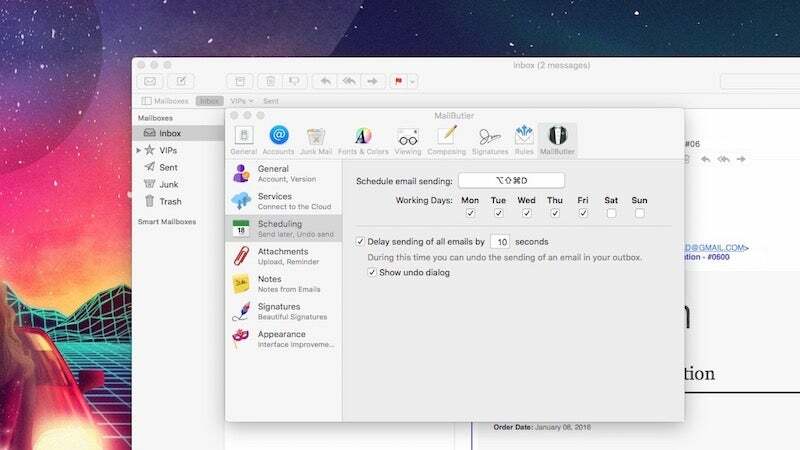 MailButler is a set of plug-ins that makes Mail a bit more powerful. MailButler comes with seven pretty self-explanatory plugins for various tasks: email scheduling, native cloud attachment support, signature templates, undo send, email to notes conversion, attachment reminders and sender avatars. Basically, MailButler adds in a ton of features that come standard in other email apps to Apple Mail, so you can get that native Apple experience without dealing with the mostly lacklustre third-party email options. Everything seems to work as advertised, and it's a pretty handy way to add in some power-user functionality to Mail. The price of MailButler is a bit confusing though. MailButler is priced in subscription tiers. A free account gets you one user account and 20 actions a month, meaning you can use MailButler's features 20 times in a month (you can track your usage in the Preferences panel). Beyond that, it's a monthly fee of about $US9 ($13)/month, which is pretty absurd, all things considered. However, the free tier should be plenty for most people, so it's worth a look if you're a fan of Mail but need more in the way of features.